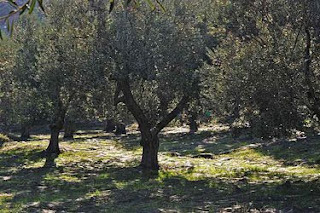 Now that most of the tourists have gone, work in the olive groves can start. The nets have to be spread out under the trees and the olives are nearly ready to be harvested. The olive tree (olea europaea) is a tough tree which is difficult to destroy. You find it all around the Mediterranean, never far from the sea. In more than one country you will find famous and very ancient olive trees, some of them older than 2000 years. According to Greek mythology the olive tree was a present from Athena, the goddess of Wisdom. She won a competition with Poseidon, god of the Sea — giving the best present to the city of Athens. This is how the first olive tree grew on the Acropolis. In the 4th century BC the father of biology, Theophrastus, recognized the olive tree on the Acropolis was the one given by Athena. Pausianus, a famous traveller and geologist, living in the 2nd century, wrote (in the year 170) that when the Persians set fire to the Acropolis, at the time of the battle of Salamis in 480 BC, Athena’s tree was also burned. However, on the same day, a new branch emerged from the blackened trunk and the olive tree survived. There used to be another famous olive tree in Athens, in the western part: Plato’s Olive, where it was said that some 2500 years ago Plato held his academy. The tree lived through many turbulent centuries until 1975 when a bus drove into it and not only damaged the tree but uprooted it too. Most of the old trees have fascinating whimsical forms and no wonder many people have fallen in love with them, so much so that they give a cheery salute to their silver grey leaves. The tree itself does not have too many enemies, although the fruit, the olives themselves can be attacked by a particularly nasty pest: the olive fruit fly bactrocera (dacus) oleae, known by the Greeks as dakos. The females of species lay eggs in a olive and when they become larvae, they feed on the olive for ten days before becoming adult flies. By that time you can forget about the olive! In this way a single female fly can damage around 400 olives; and through the summer months at least 5 generations of these flies can be born into the world. When after World War II chemical pesticides were introduced to farming, the Greeks, just like many other Europeans, were so happy with this new killer spray they hired planes to douse the landscapes with the mission: kill the dakos! The result was a bigger harvest of olives and better quality oil. Well, I am glad that since I’ve been living here, these planes have never appeared. I would have stayed inside the house for at least a week if they sprayed their lethal cargo. Fifty years later even children know how poisonous these pesticides were. For other farmers, including those into viticulture, it is easier now to farm organically without chemicals, but for the olive farmers there is still no way to find an environmentally friendly way to completely eliminate the dakos fly. Although most farmers here on the island have changed their farming ways: the poison sprayers are more and more banned from the orchards with signs warning: ‘organic garden’. This does not mean that all owners of olive trees did it for a safer cleaner environment. No, the Lesvorian olive farmers have changed to organic because they get a good subsidy to do so. The result is that at many entrances to the olive groves there are signs saying they are ‘organic only’ and in the trees you will see little square green or white bags (pheromone traps) which contain a powder to attract the male olive fruit flies. As soon as a male touches the powder and flies away with some on his legs, other males think he is a female and will follow him instead of the females. This way fewer and fewer females get fertilized. How do they find such things out?! Another way to get rid of the dakos is by hanging plastic bottles in the trees containing a mix of ammonia, water and honey or some other sweet juice which will attract the flies. In these ways the islanders hope finally to get rid of the olive fruit fly. But organic farming remains a difficult choice because without the dakos you have a bigger harvest of good quality while using these organic methods not all flies are immediately killed, which means that it’s very likely in the first years of organic growing the harvest can be disappointing. This year on Lesvos the expectations were that they could harvest some 25.000 tons of olive oil. However due to the frequent rains in spring this number has to be reduced to 8.000 tons. Another problem comes because many farmers aren’t able to look after their groves and their trees more or less run wild and bear less and less fruit. Because of a lack of money some farmers don’t plough under the trees at the beginning of summer, nor can they afford to hire a specialist to prune their trees. Thanks to mass production in countries such as Italy and Spain (where I bet they do not grow organic olives) the prices of the olives goes lower and lower, putting small farmers in a vulnerable position. But anyhow it will be virtually impossible to remove the olive tree from the Mediterranean landscape. Not only are the trees tough, but so are the people who live with them. They are born amongst the olive trees and grew up on olive oil. It is a tradition that cannot easily be lost, neither because of dakos the olive fruit fly, nor the pressure from international olive businesses.